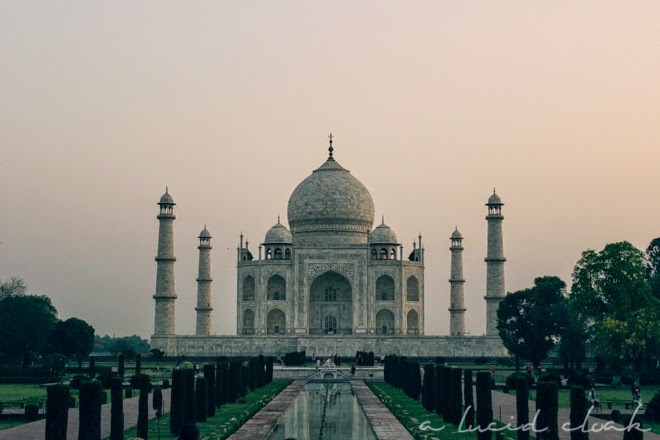 Known mostly for housing one of the Seven “Wonders of the World” (at least according to this list), Agra is a destination that many travellers consider spending only one night in. The reasons they list for their short stay include: it’s dirty, it’s touristy, and there’s nothing to see except for the Taj Mahal. 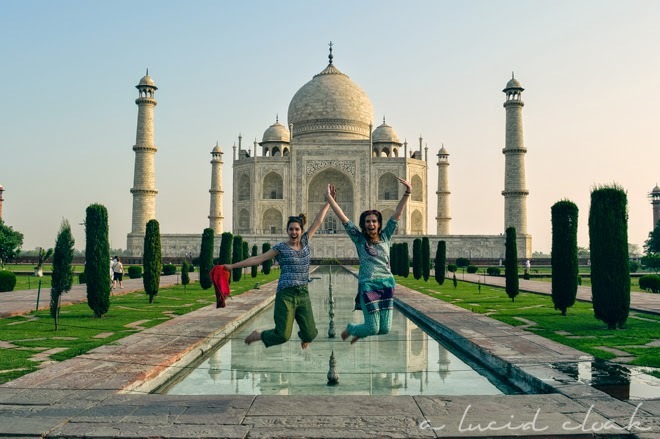 While some of these things may be true, Agra is definitely not to be overlooked or ignored. 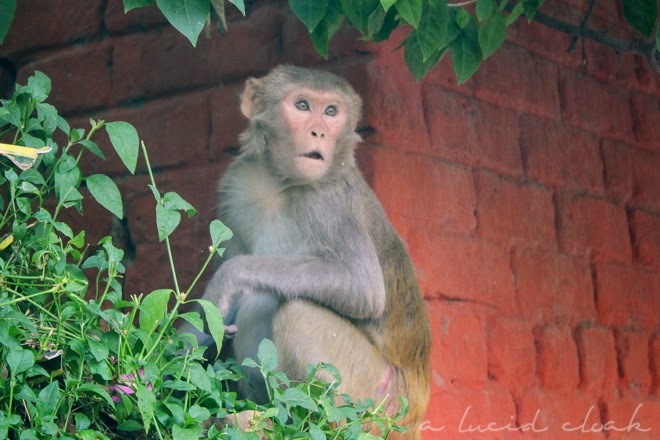 One of the most traumatic experiences of the entire trip was getting horribly scammed in Delhi while on our way to Agra. 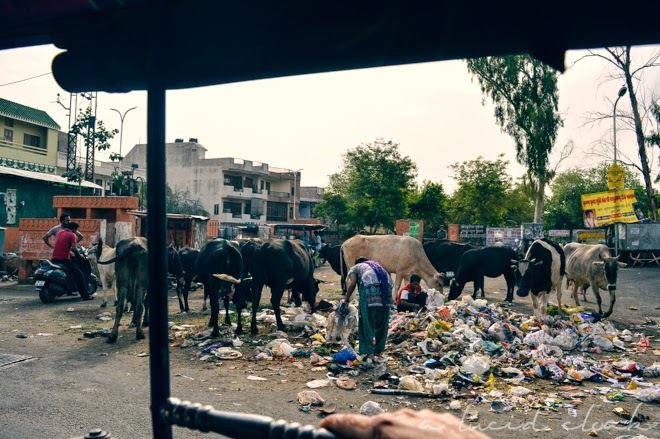 Milos and I were experiencing terrible food poisoning at the time, and when we learned that our train bound to Agra wasn't at the terminal, we had no motivation to go and find help. Thousands of people walked by us as we sat on the steps, piled with baggage, close to tears, pale-faced, and confused. After an hour of this, a man helped us and offered to send us to a "tourist office" where they could refund our ticket and get us on another train. The only problem was that the "tourist office" was not at all legitimate. We should have known when they wanted to sell us a $1000 tour all around India. We should have known when they fake-dialled our friend on the phone and pretended to "talk" to him. We should have known when they gave us a very high price for a car to Agra, which was apparently the only option we could take. The sad thing was, that by the end of the tourist agent's scamming enterprise, we did know we were being scammed. But we also did not have a single ounce of energy left within us to argue. 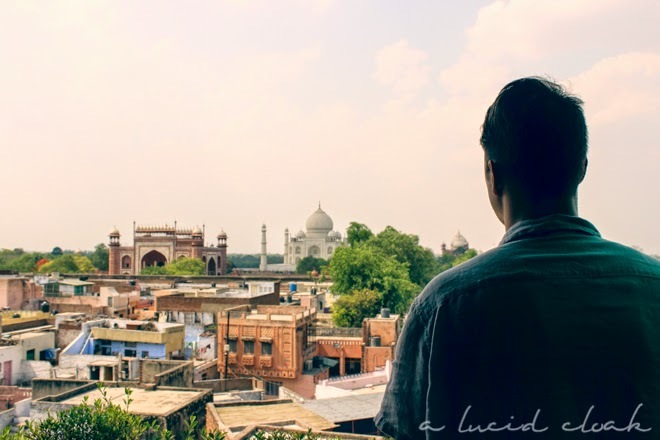 Being taken advantage of in Delhi was one of my worst experiences on this trip, and is part of the reason why I would hesitate to recommend India to other travellers. Getting to Agra was refreshing, especially when we arrived at our hotel. Although the wifi was spotty and barely there, the wonderful garden patio and the monkey family always hopping about made it an enjoyable experience. 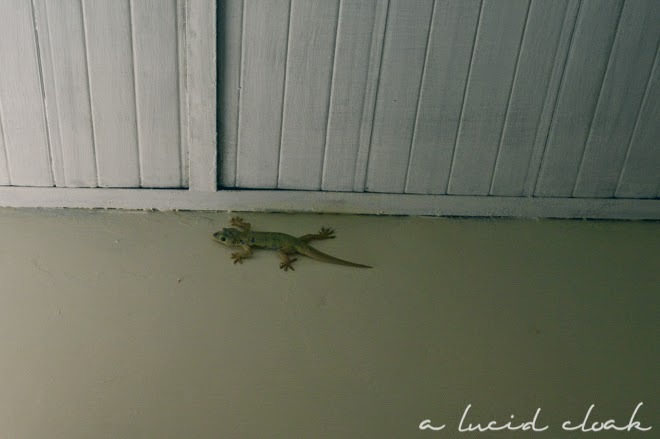 The four of us all happened to have little gecko friends in our room… and while their constant stare was disquieting at first, we warmed up to them when we realized they kept the bugs out! 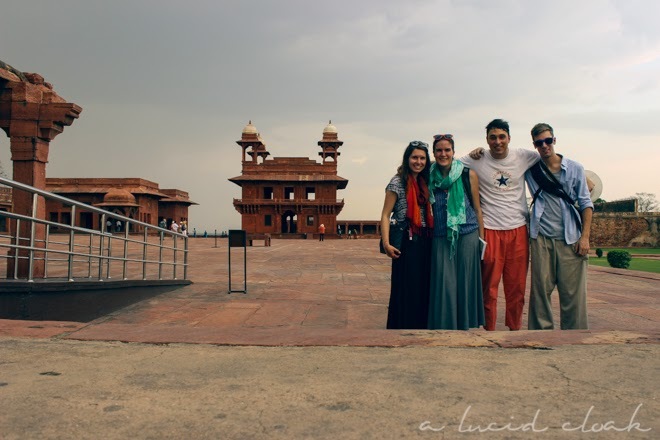 Since Milos and I were still experiencing the effects of Delhi Belly, we decided to spend our first day in Agra at Fatehpur Sikri instead of waking up at sunrise to see the Taj Mahal. Fatehpur Sikri is an ancient fort about an hour west of Agra built by Emperor Akbar (the good) in honour of a saint who predicted the Emperor's long-awaited son. 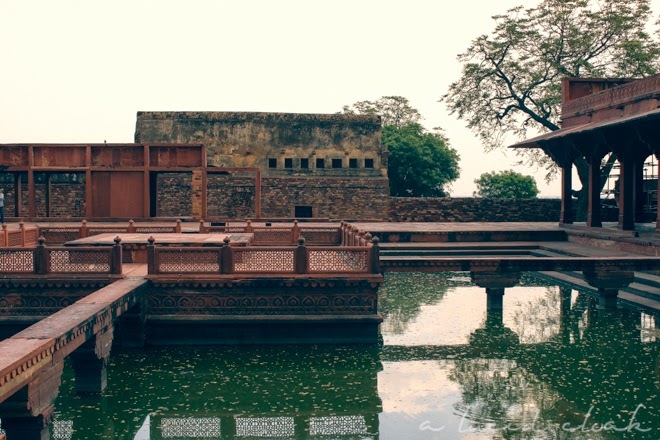 Exploring the walled fort and its buildings was probably the most calming experience we had in all of India, due to the fact that there were barely any other people there! It was almost as if we had the entire place to ourselves. Of course, as soon as we left the enclaves of the fort, we were attacked by touts and beggars and sellers of various items. Ignoring their begging is extremely difficult, and we ended up being pulled into a shop and buying a few (overpriced) items. 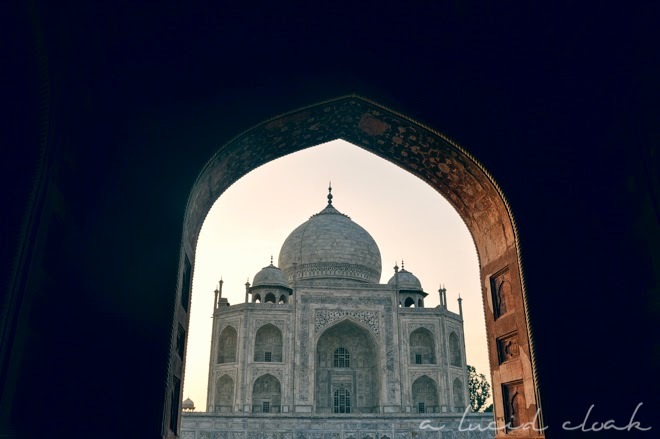 The next morning, we woke up bright and early to experience the Taj Mahal at sunrise. Visiting this world wonder had been a dream of mine for many, many years. I had often fantasized of the moment when I walk through the entrance gates and first catch a glimpse of the spectacular marble structure. None of my dreams and imaginings, however, lived up to the experience of seeing it first hand. First of all, the building is huge! This is something that does not come across until you are standing right underneath the dome, looking up at the glittering whiteness that surrounds your entire vision. Second of all, the entire setting of the Taj is absolutely beautiful — the vibrant grass, the clear waters and moats, and the two buildings on either side of the Taj Mahal acting as perfect frames. The area was peaceful and quiet despite other tourists being there. Evidently everyone was experiencing a similar state of shock, awe, and reverence. After walking around the grounds for about two hours (and taking a million and one photos), we headed back to the hotel to nap and stay inside during the hottest part of the day. After our siesta, we decided to check out the Saniya Palace Hotel's rooftop restaurant. 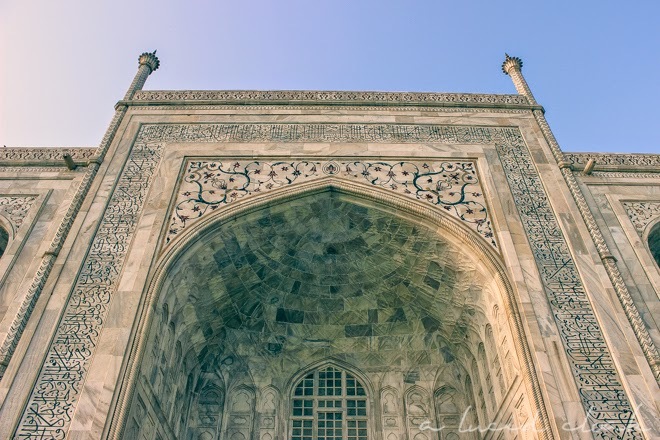 The food was delicious, and the patio had a multitude of fans, awnings for shade cover, and a view of the Taj Mahal.